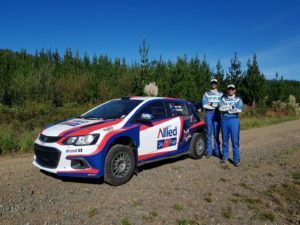 Allied Petroleum have continued our sponsorship of Dave Holder while he competes in the Brian Green Property Group New Zealand Rally Championship this weekend at the Otago Rally. The car is looking great with our Allied 24/7/Fuel brand, and Allied Petroleum is also NZ’s Authorised distributor of Mobil 1 – which also features on the livery. Dave exploded into the NZ Rallying scene in 2012 and within five short years, on a very limited budget became NZ National Rally Champion. It was an exceptional and unprecedented performance that remarkably also included Dave collecting a host of other NZ Championships along the way. In the 2017 NZ Championship he and co-driver Jason Farmer were chosen as guest drivers for the manufacturer supported Hyundai NZ and Holden teams. The duo didn’t disappoint winning the Otago Rally, something we hope they can achieve again this weekend.